There are many ways to keep food from sticking to dehydrator trays and in this article, we are going to take an in-depth look at why food sticks to dehydrator trays and what you can do to prevent it. Hopefully, by the end of this article, you’ll be able to understand the reasons why food sticks to trays and how you use various tips and tricks to save the hassle of cleaning dirty trays. Here are some common accessories that you can use to prevent food from sticking to dehydrator trays. Remember, you can buy accessories that are meant for your specific model of the dehydrator, or you can get generic products that you can customize as per the size of your dehydrator trays. There can be several reasons why food sticks to dehydrator trays. Some of these are because of the nature of the food, while others are because of the temperature, humidity and the way you’re trying to dehydrate the food. Let’s have a quick look at why some food sticks to dehydrator trays. You’ve not blotted the meats before putting the pieces in the dehydrator. Rich in sugar, apples tend to stick to the trays if the slices are too thin. If you flavor bananas with cinnamon or honey, it can melt and stick to the trays. Strawberries often get stuck to dehydrator trays as these are sugar rich. Tomatoes tend to stick to the trays if they’re not treated in advance to prevent sticking. If you’re making jerky and it’s not dried properly, it might get stuck to the trays. Raspberries are sweet and tend to get stuck to dehydrator trays as well. If you're tired of food sticking to the dehydrator trays, there are certain steps you can take to make drying food easier. We’ve divided these steps into three categories so that you can better understand the importance of these steps. Slice the food in equal sized slices as recommended in the recipe. If the slices are too thin, they will stick to the trays as the food dries. In the case of sugar-rich foods, such as fruits, treat these in a solution of equal parts lemon and water to prevent browning and stickiness through the dehydration process. Blanch the vegetables as it blocks the enzymes that can change the texture and taste of the food while it's drying. It can also prevent vegetables from sticking to the trays. Use a parchment paper to place the food slices so they don't stick to the trays. If you’re using parchment paper for drying jerky, remember to flip the pieces through the drying session so that both sides of the meat get an equal amount of heat. Use a plastic mesh screen to prevent food from sticking to the trays. If the food gets stuck to the mesh screen, simply bend the screen and the food slices will come right off. You can also lightly spray the trays with a non-flavored cooking oil. But be careful as cooking oil reduces the lifespan of dehydrated food. If you’re using the dehydrated food immediately for consumption, you can use this method. Make sure there is ample space between the food slices and the slices don't overlap while they're on the trays. Always use fresh produce for dehydration. If the fruits or vegetables are overripe there is a possibility that they might get stuck to the trays. 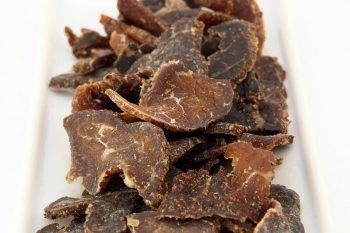 If you’re making jerky, use a paper towel to blot away any oil or moisture on the jerky slices before you set them in the dehydrator. Dehydrate according to the recipe instructions. If the recipe calls for higher temperature during first few hours of drying the food, follow that. It helps to bring out the moisture so that food can dry from inside out. Observe the food while it's drying. Flip the slices midway through drying so that they do not stick to the trays by the time the drying session is over. Keep a track of the time for which the food is to dry as mentioned in the recipe. Check a piece or two to ensure food is drying properly and not sticking to the trays. While making jerky, you can also use a paper towel as a blotter for any excess moisture or oils that might appear on the surface of the meat slices. Let the trays cool down before removing the dried pieces from the trays. Check the pieces, if they’re not completely dry, let them dehydrate for some more time till all moisture is out of the pieces. Use a mist of water on the dried pieces and then you can lift them off the dehydrator trays easily. You can also try putting the trays in a refrigerator and once the food slices have cooled down enough, you can try lifting them off with your fingers. If all else fails, use a wooden spatula to remove the pieces from the trays. In certain rare cases, you might not be able to get the food unstuck from the trays by using any of the methods mentioned in the article. But you still need to use your trays. Here are some ways to clean your trays of the food that’s already stuck to them. Soak the trays in a solution of soap and water overnight. By morning, these should be easy to clean. Check if the trays you’re using are dishwasher safe. If they are, you can keep the trays in your dishwasher with the lowest setting on and warm water. Avoid using hot water as it might warp the trays. If the food pieces are still stuck to the trays, you can use a small brush and running water to clean those off the trays. You can also soak the trays in a sink of water and sprinkle some Epsom salts over it so that it can remove all the sticky residue from the trays. If your dehydrator uses steel trays, you can use a powerful jet of water of clean off any residue from the trays. You can also use a small brush to clean the tight spaces between the tray where the food particles often get stuck. Here are some frequently asked questions users have about cleaning their dehydrator trays. Q: I tried to dehydrate apple slices, but now they’re all stuck to the trays. How can I get them off? 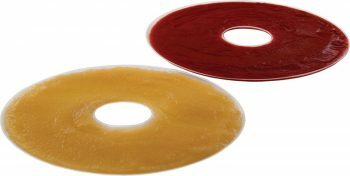 Apple slices are rich in sugar and moisture that’s why they have a tendency to get stuck to the trays. If your dehydrator trays are made of good quality plastic, you can try bending the trays slightly till the pieces rise from the tray on their own and then you can pull them off. Q: Can I use wax paper to line my dehydrator trays for drying the next batch of fruit? Avoid using wax paper as it can get heated up too quickly and start to burn. You can use parchment paper or plastic mesh screens for placing food slices as these are safe for use in dehydrators. Q: Should I invest in steel dehydrator trays? Do these prevent food from sticking to the trays? The material of the trays is only one factor when it comes to food sticking to the trays. Preparation of the food, drying times, and several others factors affect the food sticking to the dehydrator trays. Steel trays may or may not make much of a difference while you’re drying the food slices, but cleaning up steel trays is much easier than cleaning plastic trays. And steel trays are any day more durable than plastic trays. Q: Is there anything I can do before dehydrating to prevent food from sticking to the trays? The most important thing is to slice the food slices in an equal width. Follow the thickness suggested by your recipe for best results. You can also try lining the dehydrator sheets with parchment paper or Teflex non-stick sheets. Q: I am trying to make jerky in my new dehydrator, but it keeps sticking to the dehydrator trays. What am I doing wrong here? If jerky is sticking to the dehydrator trays, there are a few things you can do to prevent this. First off, freeze the meat before you slice it into pieces as the pieces need to be equal width for proper drying. Second, use a tray lining like parchment paper so that the pieces don’t get stuck to the tray. Third, dehydrate at the optimum temperature for the time suggested by the recipe. If you dehydrate for too little or too much time, you might end up with a different end result. Dehydrating foods is a fun and easy task with great rewards in form of delicious dried snacks. If you follow the tips given in this write-up, you can also prevent your food from sticking to the dehydrator trays. Most of all, don’t be afraid to experiment when you’re dehydrating foods and always seek to learn when you make mistakes. This will help you to avoid making the same dehydrating mistakes the next time. If you find food stuck to the dehydrator after a drying session, don’t lose heart. Simply try any of the methods mentioned above to get the food off the tray and then clean it properly. You can always try to dry a different kind of food and get the result you were looking for. 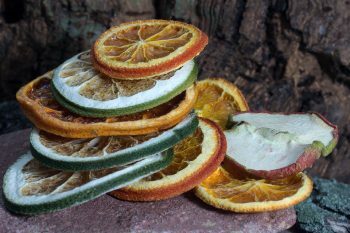 For more information on dehydrators, dehydrating techniques, and accessory reviews, please browse through this blog. If you have any queries, please feel free to leave a comment and we’ll answer your question as soon as possible. Are you referring rondo as a dehydrator model? I’m not sure about rondo dehydrator model.